is a right up your alley! If you are a frequent crafter who makes your own craft embellishments with fabric (like the craft flowers shown above) and secure them onto your craft tissue box with a glue gun. You may also simply use fabric to create a slip cover which can be fastened on your new tissue box and thrown in the washer. It is not recommended that you include too many embellishments on this type of cover. You and your child can decorate a craft tissue box cover in a safer way by not using a glue gun, but rather colored thermal labels, which come in many bright and shiny colors and can be cut into different shapes and designs! This allows of easy and neat application. 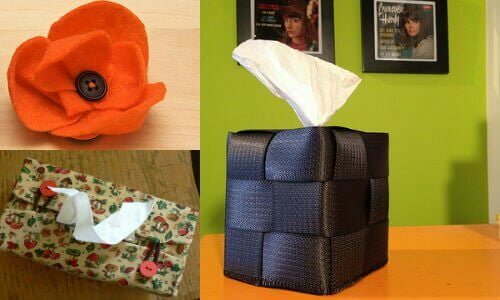 What are some ways you decorated your tissue box cover?